Stock photo of a Cessna Caravan amphibian airplane landing on Eagle River at Rifflin' Hitch Lodge in Southern Labrador, Labrador, Newfoundland Labrador, Canada. This small aircraft, the Cessna Caravan amphibian airplane can land on water as well as land. 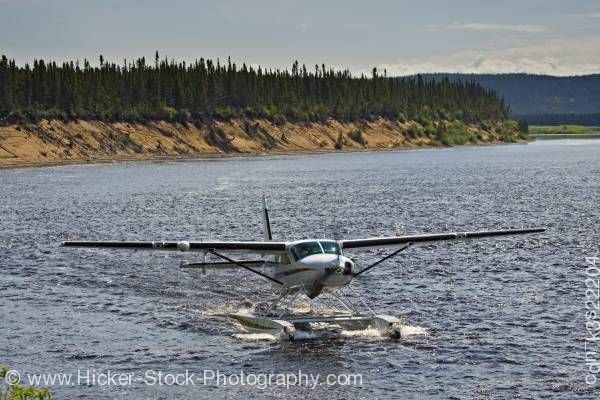 This stock photo shows a Cessna Caravan amphibian airplane landing on Eagle River at Rifflin' Hitch Lodge in Southern Labrador, Labrador, Newfoundland Labrador, Canada. The Cessna Caravan is a small passenger plane with a long wing span and a three blade propeller on the front of the plane’s "nose." At the bottom of the amphibian airplane has two long platforms or floats that allow the aircraft to glide across the water causing a foamy wake. The body of the plane is white with a red stripe along the side. The plane glides along the dark waters of the Eagle River. In the background, the shoreline leads to a hillside abundant in tall evergreen trees. Cessna Caravan amphibian airplane landing on Eagle River at Rifflin' Hitch Lodge in Southern Labrador, Labrador, Newfoundland Labrador, Canada.